Maggie Lee, "Gigi*s Underground," 2016. Exhibition view at 356 Mission. 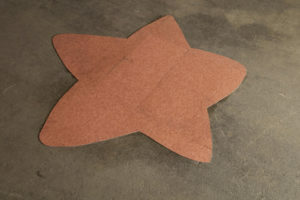 Maggie Lee, Fall Star, 2016. Cardboard, acrylic paint, inkjet paper, wire, 31 x 21.5 inches. Maggie Lee, Idea 7, 2016. Commercial vinyl tile, 53.5 x 51.5 inches. Maggie Lee, MySpace TV, 2016. Wood shelf, television, personalized headphones, 52 x 24 x 11.5 inches. Maggie Lee, Gigi's Friend, 2016. Wire, acrylic, cardboard, inkjet print, 37 x 6 inches. Maggie Lee, One Earring, 2016. Cardboard, acrylic paint, wire, 31 x 8.5 inches. 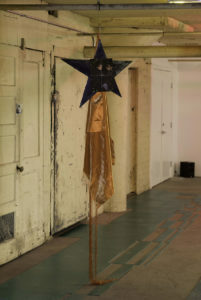 Maggie Lee, Superstar, cardboard, acrylic paint, inkjet print, satin, 82 x 23 inches. Maggie Lee, Kisses, 2016. Cardboard, inkjet print, acrylic paint, wire, 35 x 19.5 inches. 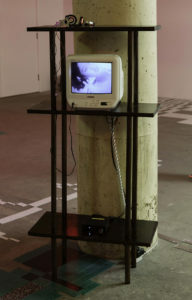 Maggie Lee, Boogie, 2016. 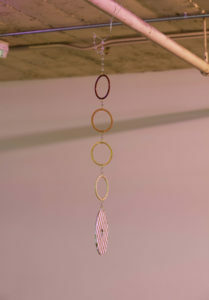 Necklace chain, cardboard, paint, 27 x 5.5 inches. Maggie Lee, Art Star #1, 2016. 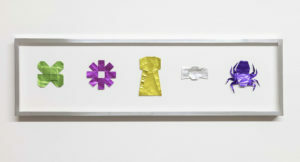 Foil paper in chrome frame, 8.75 x 30.25 x 2 inches. 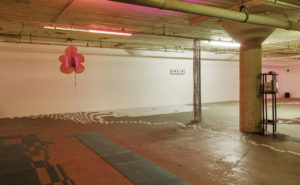 Ethan Swan: The downstairs gallery is different than a lot of spaces that normally show art. What were the basic qualities of the room you had to consider in order to make this show? 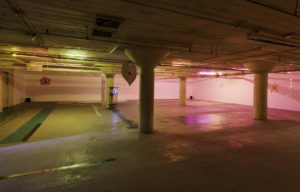 Maggie Lee: I first noticed how it was in the basement, how raw the whole space was and the two white walls. I wanted to work with the atmosphere of the underground space, to weave the artwork into the space and view it as a whole, to create an environment. Something dreamy, something LA. I knew I wanted to put just the [framed] art on the two white walls and then everything else everywhere else, keeping it kinda minimal. If this was my room, where would I put my bookshelf? ES: I liked the references to loner teens in your film Mommy and it made me think about the importance of space, of claiming separate territory. The sanctity of an adolescent bedroom. Do you feel like Gigi’s space extends that feeling, like an older version of the loner teen’s space? ML: The environment is kind of a few different places that all revolve around Gigi. There’s a party scene, an art show area, a place for her to sleep. 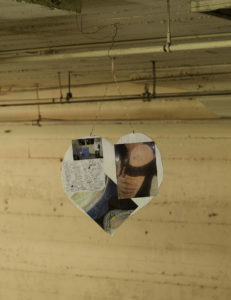 The hanging pieces represent her friends and can be seen as pages of her diary or a zine. I like to think of them as “Strings of Life.” “Good Earth” is about grounding and centering. ES: Can you introduce Gigi? ML: Gigi’s like a 20-something year old art student in 2006. It’s kind of just like, she wants to be this art star person, listening to Yeah Yeah Yeahs and all that music that’s special to her. Gigi is young, she likes the song [“Art Star” by the Yeah Yeah Yeahs], she has attitude and somewhat of an understanding of the song’s cynical connotations, but she’s not even there yet, she’s learning. When you’re in college or around that age you’re obsessed with certain things and it’s so specific. It’s so much more special then, than when you’re older. ES: And the two works hung on the wall are like her art? ML: The framed origami works are so minimal because they are really an idea of an artwork, as Gigi is an idea of a person. ES: And then the bookshelf and bed are her belongings. ML: The TV is so basic and analogue. It’s a bookshelf but it’s holding a TV, and the TV holds four songs, two are music videos and two just show the still of the CD cover so you know what you’re listening to. This evolved as we were working on the show. These were actually songs that would play on my MySpace page around that time. That feeling of ‘This represents me, I identify with this, this is like a special song I really like and I’m going to have it on my profile.’ That’s what I wanted to show on the TV. It is also nice to have the TV or music playing in the background while working in the studio. ES: What were some of the things you looked at in developing the tile works? ML: Graphic pattern stuff is kind of new to me but comes organically. It’s also an idea that’s evolved from [the exhibition at Real Fine Arts] Fufu’s Dreamhouse, with the dioramas and the floor plans. That kind of pattern making is exciting for me. 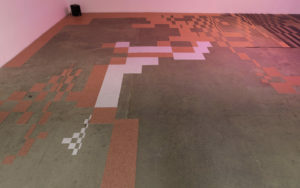 Linoleum tile is also a suburban thing that I always liked and I wanted to work with that material but create patterns. The space is so big, I wanted to take up the whole space. I like the gothic bourgeois style of the floor in Dario Argento’s Suspiria. The book Underground Interiors by Norma Skurka helped me think about creating a space where people want to spend time and can just be there. And I also thought a lot about La Monte Young’s Dream House. ES: Did the tile work how you expected? ML: It was so hard to figure out how to do it because I’ve never worked with it though I’ve seen it done before. I first made a floor plan to draw out patterns but that got complicated. What ended up working was cutting up a bunch of tiles and just experimenting. I love that it divides the room in different spaces and each one is a kind of fragmented idea forming, taking on different patterns, coming in and out of the center. The colors represent different areas that her life takes place in. The center is the most important, I wanted to keep it kind of empty because that’s the space where Gigi’s ideas come together. It’s a clear space for her to make new things, create new ideas, and work on her art. ES: Can you talk about the different patterns and colors? ML: Idea 1 (green) is like a superstar runway, Idea 2 (white) takes place at school, Idea 3 (pink and white) is evolving from a place of study to a place of love, Idea 4 (pink to black) is a mix of love and the underground scene, it turns into kind of a dance floor, Idea 6 is a place of peace, a place to reflect. 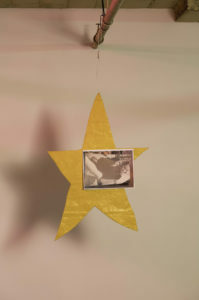 Idea 8 (the border) make up the walls of Gigi’s center, there is a lily growing on one side. ES: How do you describe the overall vibe? You said early on you wanted to make something “dreamy and a little psycho” do you feel like you made that work? 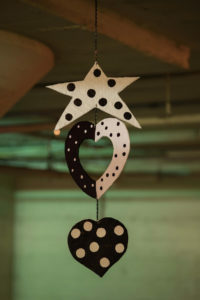 ML: I like working in stars and hearts because I think it’s important to surround yourself with happy things. But it’s so cute at the same time and I didn’t want to make a cute art show. The element that really helped emanate the overall tone was the lighting. I’m really into fuchsia and lush pink colors, it reminds me of electroclash. There was also this black gel that I was really into, it turned into a green garbage color in the light. The floor pattern definitely adds to the psycho element. ES: I like the sense of blurryness and a little bit of unreality presented by it which has a lot to do with the sound. ML: When you have an idea for something, you don’t exactly know what it is. It’s just a silhouette of an idea until you start making it and you begin to see the form. That’s kind of how the sound travels in the space. It kind of divides the room, you can hear one side is playing rain, like it’s raining outside. One side is playing club techno music but it sounds like it’s muffled by a wall. 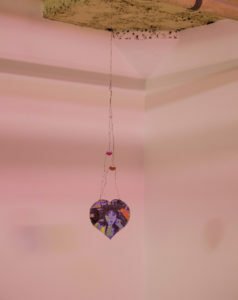 Another element is small bursts of lyrics from various songs that take place in Gigi’s subconscious and there are other abstract sounds like from Jessica Rylan’s Jealous Heart instrument. In the center, everything kind of morphs, complementing each other. It’s a whirlwind of things that are happening and coming together. ES: Can you talk more about the underground? ML: When I was back home after my first visit, and thinking about what to do for the show… I just liked how the gallery is underground. 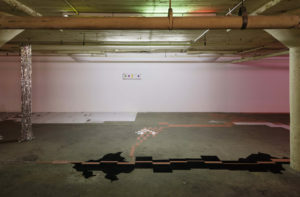 It was on my mind that Brendan Fowler works right there and he’s always talking about the underground, and Ooga Booga is so much about the underground and the gallery is in the store. Chrissie Iles and I had a conversation about the scene and she talks about how the underground is where things form and germinate. I’m vibing off the space and what’s around here and how I relate to it. ::whispers:: Gigi is secretly me in 2006.